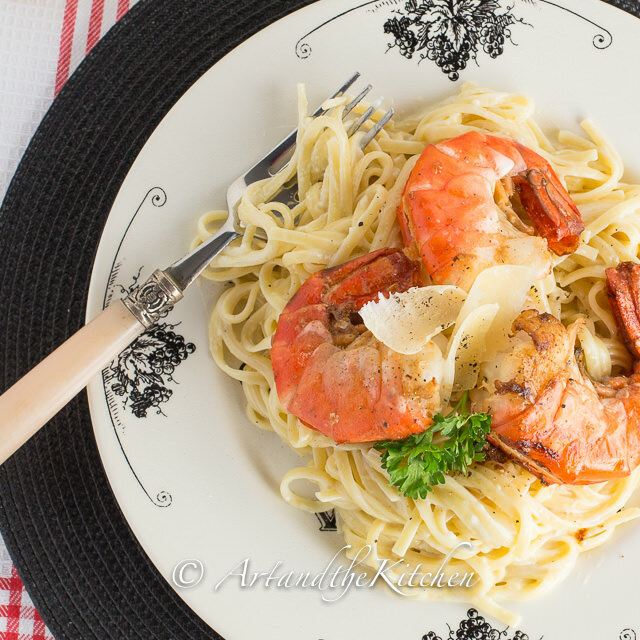 Enjoy this quick and easy recipe to make creamy Fettuccine Alfredo with Pan Seared Shrimp. Happy New Year to everyone! May 2015 be a wonderful year; full of love and laughter with family and friends. I like to make something special for New Year’s Day dinner and this terrific recipe for Fettuccine Alfredo with Pan Seared Shrimp can be whipped up in no time. 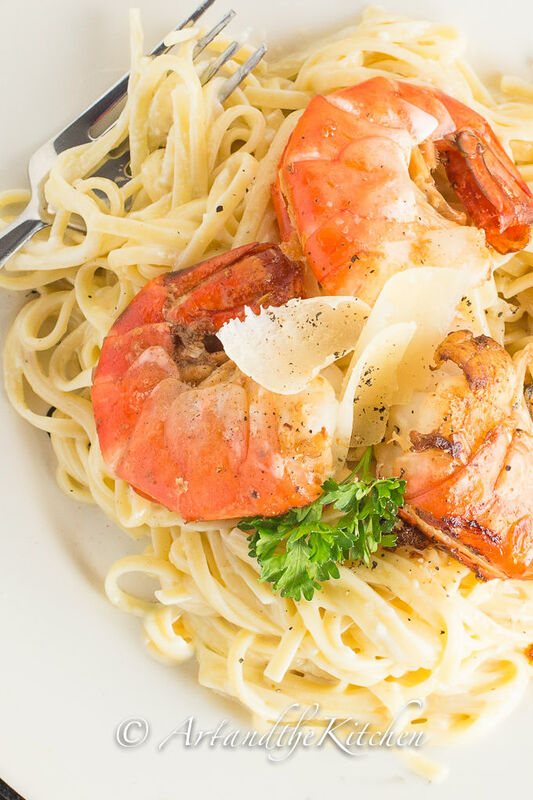 Topped with fresh jumbo shrimp that are pan seared to perfection and you have an amazing dish with that gourmet look and flavour! 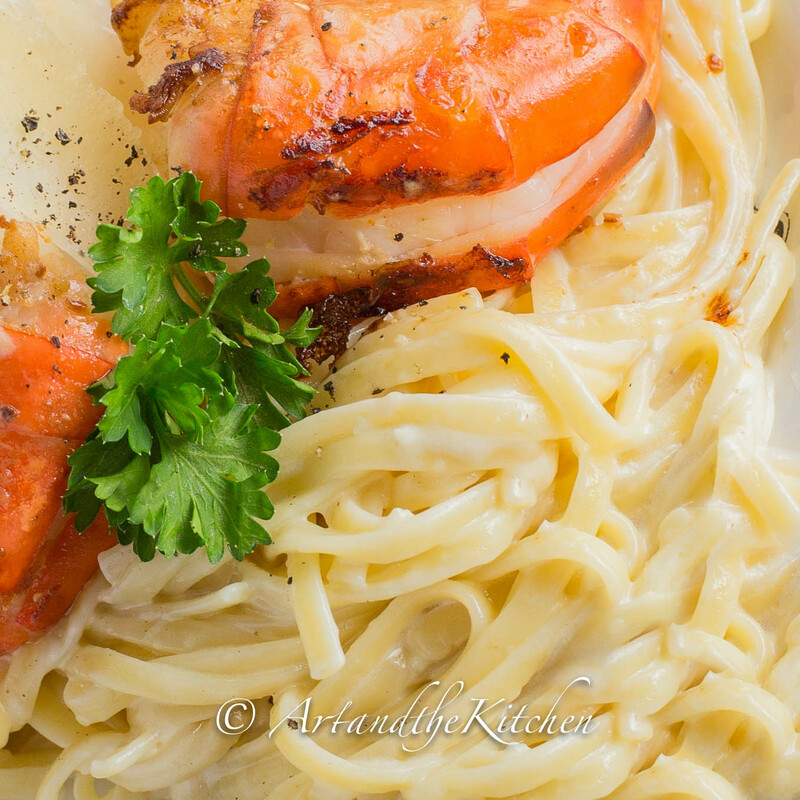 rich creamy Alfredo sauce with fresh jumbo shrimp that are pan seared to perfection. Melt butter in sauce pan over medium heat. Stir in cream and bring to a simmer, stirring often. Stir in parmesan cheese, continue to simmer for 10-15 minutes until sauce has thickened, stir often. While sauce is simmering prepare pasta and shrimp. Cook pasta in large pot of salted water until desired doneness. I cooked my shrimp and served with shells on, but if you prefer remove shells prior to frying. Heat olive oil and 1 tablespoon butter in large skillet, medium high heat. Add garlic cloves that have been smashed down. Add shrimp and cook until shrimp turns pink about 2-3 minutes per side. Cook shrimp in batches to avoid overcrowding the frying pan. (keep cooked shrimp in warmed oven while preparing all the shrimp). 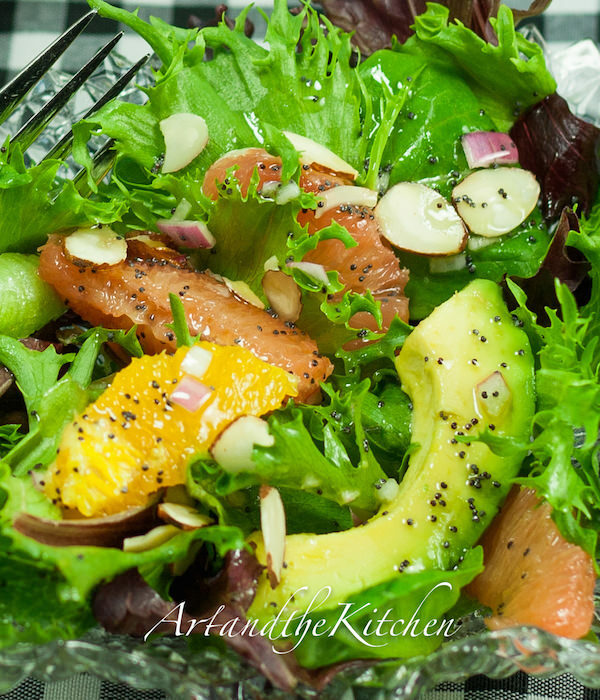 Add more olive oil and butter as needed. 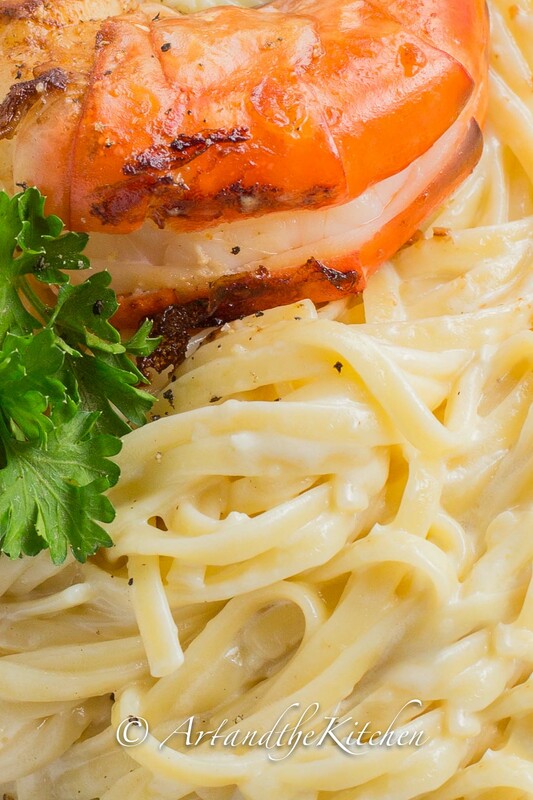 In large bowl toss pasta and Alfredo sauce together. 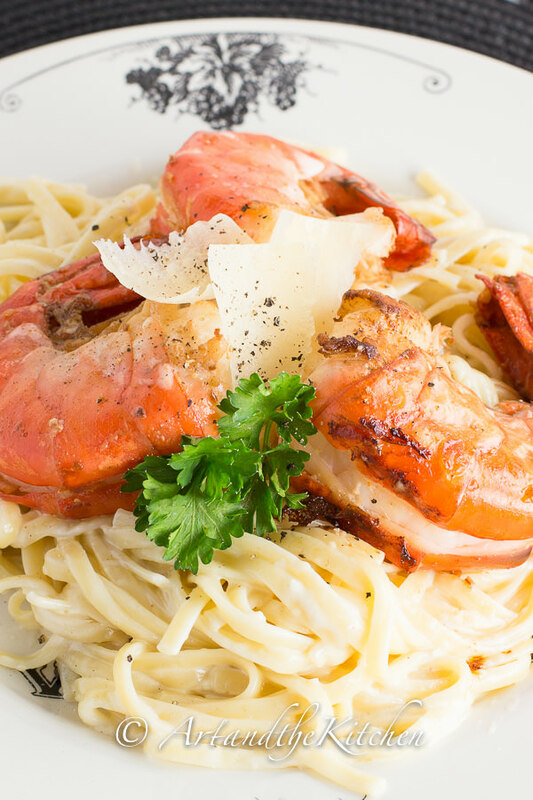 Serve topped with shrimp, garnished with parmesan shavings and fresh ground pepper.